Mitt Romney won the Iowa straw poll this weekend with 31.5% of the vote, ahead of second placed Mike Huckabee with 18.1%. The final result contained a few surprises. The media naturally spun the outcome in different ways. The National Public Radio lead with Iowa straw poll yields limited victory for Romney, while Australia's Sydney Morning Herald took a more irreverent view separating the wheat from the chaff. The Boston Herald reported that Romney did not believe his victory was a hollow one. Time Magazine's What Iowa’s straw poll tells the GOP provides a more in-depth view. While Romney was widely expected to win in Iowa, Mike Huckabee's second place is attracting attention, lifting his national profile. According to USA Today Huckabee spent just $58 per vote for 2nd place in Iowa. This is likely to keep him in the campaign for a while yet. 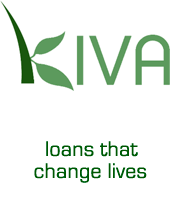 His odds of dropping out by December 31st, dropped from 67.5% to 50% at Intrade. Rudy Giuiani, John McCain and Fred Thompson all skipped Iowa. McCain instead focused his attention on New Hampshire. There's speculation that Tommy Thompson may now scrap his Presidential bid following his 6th place showing. While Mr (T) Thompson may be looking for the exit door, there's talk brewing about Newt Gingrich wanting in. Rudy Giuliani continues to lead the national polls. Here's how the Angus Reid Global Monitor reported findings on August 12th. According to the prediction markets, Giuliani continues to lead the GOP candidates in this format too. Giuliani has a SMARTCROWD rating of 31.74%, followed by Fred Thompson on 26.01% and Mitt Romney at 25.18% (trending up), following his victory in Iowa. John McCain continues to score in the single digits with a rating of 6.27%. At Intrade, Newt Gingrich is rated at 35.5% (on small volume), suggesting some believe he might actually enter the GOP nomination battle. In the Democratic nominee markets, Hillary Clinton further extended her lead. She now has a commanding SMARTCROWD rating of 55.65% (and trending up). According to the markets she's the clear favorite to become the Democratic Party's Presidential nominee. 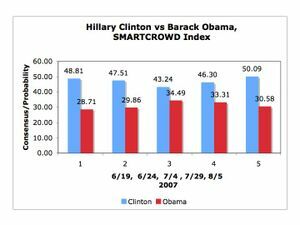 Barack Obama's rating slipped in the same markets; his SMARTCROWD rating is now below 30%, currently standing at 25.27% (trending down). See chart. Last week, we wrote about the prospect of (perhaps only a slim chance today), the big 3 contenders for the White House in 2008, being Hillary Clinton, Rudy Giuliani and Michael Bloomberg (if he annouces he's running); all from New York. The New York Times article No, It Wouldn't Happen. Couldn't. No Way considers this prospect in depth. That's it for this week's coverage. Bloomberg - is he running? Speculation continues about New York Mayor, Mike Bloomberg, and whether he'll run as an Independent in '08. Ed Koch of the Washington Post reckons he will and explains why in his article I Like Mike. So Will You. News outlets also reported that former Democratic Senator Sam Nunn (Georgia) and Bloomberg talked about the need for an independent challenge in 2008. Read Not Running Mike is Talking from the New York Post and Bloom and I talked about Prez race: pol from the Daily News. The International Herald Tribune covered it too. Bloomberg, however, has consistently denied he is a candidate. In the prediction markets, Bloomberg is given a 41.5% probability of running at FT Predict, and 51.3% in thin trading at Inkling Markets, reflecting the constant speculation and suggesting i) it won't be a much of a surprise if he does run and ii) that traders and pundits don't place much value on his denials; making it more of a question of when, not if, in their minds. Expect this cat-and-mouse game to continue for a while; at least until its clear who the Democratic and GOP nominees are going to be. According to a Washington Post-ABC News poll in Iowa, released August 3rd, the leading Democratic contenders are virtually tied in their race for the Presidential nomination in Iowa. Listen here to CNN's podcast explaining the findings. The Iowa caucus and the New Hampshire Primary are litmus tests for the national campaign and a defeat in either or both states can have a damaging impact on a candidate. The Iowa poll is at odds with national polls. Here's how the Angus Reid Global Monitor reported findings on August 4th. 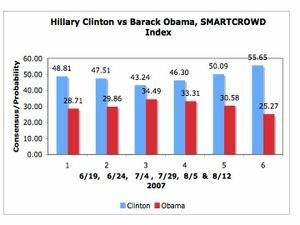 In the prediction markets, Hillary Clinton currently has a SMARTCROWD rating of 50.09%, extending her lead over Barack Obama whose equivalent rating is 30.58% (refer chart). John Edwards' SMARTCROWD rating is 7.85%. Hillary Clinton is now the clear favorite for the Democratic nominee, making her a genuine contender for the White House. On the other side of politics, Rudy Giuliani secured a narrow lead among the GOP contenders, but Fred Thompson and Mitt Romney are still in contention for Republican nomination. Here's how the Angus Reid Global Monitor reported findings on August 6th. Demonstrating how open the Republican race is, however, the Washington Post-ABC News poll focusing on Iowa, favored Mitt Romney. In the prediction markets, Rudy Giuliani has a SMARTCROWD rating of 33.77%. He leads Fred Thompson at 29.08% and Mitt Romney at 21.78%. The International Herald Tribune ran the article: Rivals for Republican nomination for US President seek distance from Bush, following tonight's GOP debate in Iowa. How will New Yorkers and Americans react to the possibility - perhaps remote at this point in time - that New Yorkers Hillary Clinton, Rudy Guiliani, and Mike Bloomberg might be the last ones standing in the '08 race for the White House? Will it happen? Will it matter? What's the probability of Bloomberg (I), Clinton (D) and Giuliani (R) being the primary challengers after the DEM and GOP nominations, and after Mayor Bloomberg makes up his mind for certain? Perhaps about 10%, right now, based on current probabilities. We'd welcome hearing a more accurate calculation and/or seeing a prediction market contract to give us a regular signal.